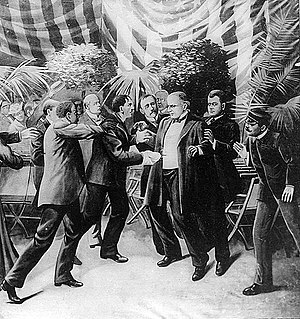 Leon Czolgosz shoots President McKinley with a revolver concealed under a cloth rag. Clipping of a wash drawing by T. Dart Walker. On September 6, 1901, William McKinley, the 25th President of the United States, was shot on the grounds of the Pan-American Exposition at the Temple of Music in Buffalo, New York. He was shaking hands with the public when Leon Czolgosz, an anarchist, shot him twice in the abdomen. McKinley died eight days later on September 14 of gangrene caused by the gunshot wounds. He was the third American president to have been assassinated, following Abraham Lincoln in 1865 and James A. Garfield in 1881. William McKinley was the 25th president of the United States, serving from March 4, 1897, until his assassination six months into his second term. McKinley led the nation to victory in the Spanish–American War, raised protective tariffs to promote American industry and kept the nation on the gold standard in a rejection of free silver. 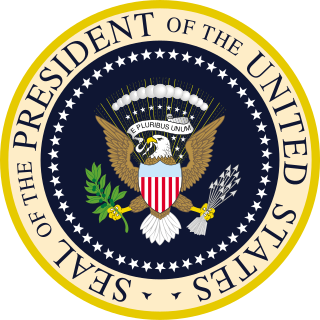 President of the United States (POTUS) is the title for the head of state and head of government of the United States of America. The president directs the executive branch of the federal government and is the commander-in-chief of the United States Armed Forces. The Pan-American Exposition was a World's Fair held in Buffalo, New York, United States, from May 1 through November 2, 1901. The fair occupied 350 acres (0.55 sq mi) of land on the western edge of what is now Delaware Park, extending from Delaware Avenue to Elmwood Avenue and northward to Great Arrow Avenue. It is remembered today primarily for being the location of the assassination of President William McKinley. McKinley had been elected for a second term in 1900. He enjoyed meeting the public, and was reluctant to accept the security available to his office. Secretary to the President George B. Cortelyou feared that an assassination attempt would take place during a visit to the Temple of Music and took it off the schedule twice. McKinley restored it each time. The Secretary to the President was a former 19th and early 20th century White House position that carried out all the tasks now spread throughout the modern White House Office. 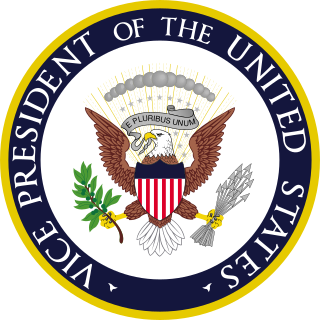 The Secretary would act as a buffer between the President and the public, keeping the President's schedules and appointments, managing his correspondence, managing the staff, communicating to the press as well as being a close aide and advisor to the President in a manner that often required great skill and discretion. In terms of rank it is a precursor to the modern White House Chief of Staff. George Bruce Cortelyou was an American Cabinet secretary of the early twentieth century. He held various positions in the presidential administrations of Grover Cleveland, William McKinley, and Theodore Roosevelt. Assassination is the act of killing a prominent person for either political, religious or monetary reasons. Czolgosz had lost his job during the economic Panic of 1893 and turned to anarchism, a political philosophy adhered to by recent killers of foreign leaders. 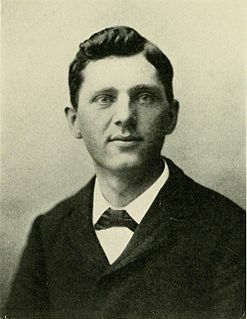 Regarding McKinley as a symbol of oppression, Czolgosz was convinced that it was his duty as an anarchist to kill him. Unable to get near the President during the presidential visit earlier, Czolgosz shot McKinley twice as the President reached to shake his hand in the reception line at the temple. One bullet grazed McKinley; the other entered his abdomen and was never found. The Panic of 1893 was a serious economic depression in the United States that began in 1893 and ended in 1897. It deeply affected every sector of the economy, and produced political upheaval that led to the realigning election of 1896 and the presidency of William McKinley. McKinley initially appeared to be recovering, but took a turn for the worse on September 13 as his wounds became gangrenous, and died early the next morning; Vice President Theodore Roosevelt succeeded him. After McKinley's assassination, for which Czolgosz was sentenced to death in the electric chair, Congress passed legislation to officially charge the Secret Service with the responsibility for protecting the President. Gangrene is a type of tissue death caused by a lack of blood supply. Symptoms may include a change in skin color to red or black, numbness, swelling, pain, skin breakdown, and coolness. The feet and hands are most commonly affected. Certain types may present with a fever or sepsis. 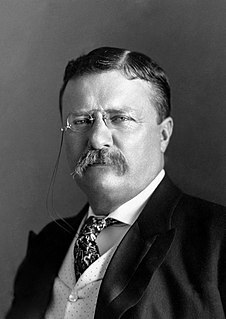 Theodore Roosevelt Jr. was an American statesman, sportsman, conservationist and writer who served as the 26th president of the United States from 1901 to 1909. He previously served as the 25th vice president of the United States from March to September 1901 and as the 33rd governor of New York from 1899 to 1900. As a leader of the Republican Party during this time, he became a driving force for the Progressive Era in the United States in the early 20th century. His face is depicted on Mount Rushmore, alongside those of George Washington, Thomas Jefferson, and Abraham Lincoln. In polls of historians and political scientists, Roosevelt is generally ranked as one of the five best presidents. William Jennings Bryan was an American orator and politician from Nebraska. Beginning in 1896, he emerged as a dominant force in the Democratic Party, standing three times as the party's nominee for President of the United States. He also served in the United States House of Representatives and as the United States Secretary of State under Woodrow Wilson. Just before his death he gained national attention for attacking the teaching of evolution in the Scopes Trial. Because of his faith in the wisdom of the common people, he was often called "The Great Commoner". 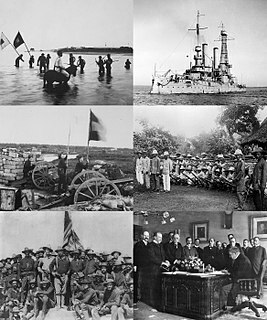 The Spanish–American War was fought between the United States and Spain in 1898. Hostilities began in the aftermath of the internal explosion of USS Maine in Havana harbor in Cuba, leading to U.S. intervention in the Cuban War of Independence. U.S. acquisition of Spain's Pacific possessions led to its involvement in the Philippine Revolution and ultimately in the Philippine–American War. Puerto Rico, officially the Commonwealth of Puerto Rico and briefly called Porto Rico, is an unincorporated territory of the United States located in the northeast Caribbean Sea, approximately 1,000 miles (1,600 km) southeast of Miami, Florida. Garret Augustus Hobart was the 24th vice president of the United States, serving from 1897 until his death in 1899. He was the sixth American vice president to die in office. The 1900 National Convention of the Republican Party of the United States was held June 19 to June 21 in the Exposition Auditorium, Philadelphia, Pennsylvania. The Exposition Auditorium was located south of the University of Pennsylvania, and the later Convention Hall was constructed along the building's east wall. It was demolished in 2006. 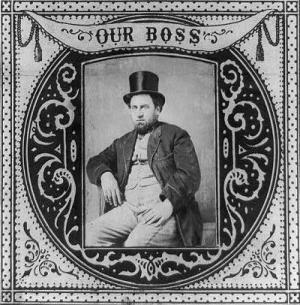 In politics, a boss is a person who controls a unit of a political party, although they may not necessarily hold political office. Numerous officeholders in that unit are subordinate to the single boss in party affairs. Each party in the same ward or city may have its own boss; that is, the Republican boss of Ward 7 controls Republican politics, while the Democratic boss controls the Democratic party there. Reformers sometimes allege that political bosses are likely guilty of corruption. Bosses may base their power on control of a large number of votes. When the party wins, they typically control appointments in their unit, and have a voice at the higher levels. They do not necessarily hold public office themselves; most historical bosses did not, at least during the times of their greatest influence. William McKinley (to the left of center, with white shirtfront) delivers his final speech. The "last posed photograph" of President McKinley, in the Government Building on September 5, 1901. Left to right: Mrs. John Miller Horton, Chairwoman of the Entertainment Committee of the Woman's Board of Managers; John G. Milburn; Manuel de Azpíroz, the Mexican Ambassador; the President; George B. Cortelyou, the President's secretary; Col. John H. Bingham of the Government Board. McKinley toured the pavilions of other Western Hemisphere nations, attracting crowds and applause wherever he went. He presided over a luncheon at the New York State Building, and attended a by-invitation-only reception at the Government Building. He was heavily guarded by soldiers and police, but still tried to interact with the public, encouraging those who tried to run to him by noticing them, and bowing to a group of loud young popcorn sellers. He made an unscheduled stop for coffee at the Porto Rican Building (a common variant spelling of Puerto Rico prior to 1932) before returning to the Milburn House in the late afternoon. McKinley arrives at the Temple of Music, shortly before being shot. The Temple of Music, as seen on a post card. Like most of the Exposition's structures, it was removed after the Exposition closed. President McKinley greeting Well-Wishers at a reception in the Temple of Music on September 6, 1901, just minutes before he was shot. Scene of the shooting inside the Temple of Music. The spot where McKinley was shot is marked with an X, near the bottom-right corner of the picture. He, the said William McKinley, from the said sixth day of September, in the year aforesaid, until the fourteenth day of September, in the same year aforesaid, in the city and county aforesaid, did languish and languishing did live; on which said last mentioned day he, the said William McKinley, of the said mortal wound did die. Leon Frank Czolgosz was a Polish-American anarchist and former steel worker who assassinated U.S. President William McKinley in September 1901. Czolgosz was executed seven weeks later. Ida Saxton McKinley was the First Lady of the United States from 1897 until 1901. The McKinley National Memorial in Canton, Ohio, United States, is the final resting place of William McKinley, who served as the 25th President of the United States from 1897 to his assassination in 1901. 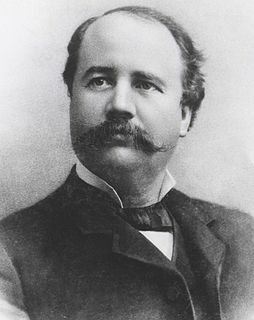 Canton was a significant place in McKinley's life; he lived there, practiced as an attorney, and conducted his political campaigns from the town. Hippolyte Havel (1871–1950) was a Czech-American anarchist who was known as an activist in the United States and part of the radical circle around Emma Goldman in the early 20th century. He had been imprisoned as a young man in Austria-Hungary because of his political activities, but made his way to London. There he met anarchist Emma Goldman on a lecture tour from the United States. She befriended him and he immigrated to the US. Theodore Roosevelt Inaugural National Historic Site preserves the Ansley Wilcox House, at 641 Delaware Avenue in Buffalo, New York. Here, after the assassination of William McKinley, Theodore Roosevelt took the oath of office as President of the United States on September 14, 1901. A New York historical marker outside the house indicates that it was the site of Theodore Roosevelt's Inauguration. Charles Rufus Skinner was a U.S. Representative from New York. The presidency of William McKinley began on March 4, 1897, when William McKinley was inaugurated and ended with his death on September 14, 1901. He is best known for leading the nation to victory in the Spanish–American War, taking ownership of Hawaii, purchasing the Philippines, Guam and Puerto Rico, restoring prosperity, and promoting pluralism among all groups. It includes the 1897 Dingley Tariff to protect manufacturers and factory workers from foreign competition, and the Gold Standard Act of 1900 that rejected free silver inflationary proposals. Rapid economic growth and a decline in labor conflict also marked the presidency. The Temple of Music was a concert hall and auditorium built for the Pan-American Exposition which was held in Buffalo, New York in 1901. U.S. President William McKinley was assassinated inside the building on September 6, 1901. The structure, like most of the other buildings at the exposition, was demolished when the fair ended. Dr. Roswell Park was an American physician, best known for starting Gratwick Research Laboratory in 1898, which is now known as Roswell Park Cancer Institute. In 1900, the Gratwick family of Buffalo helped to finance Dr. Park's laboratory with a $25,000 donation in memory of William Henry Gratwick, a patient of Dr. Park's. Dr. Park was also a professor of surgery at the University at Buffalo Medical School and a surgeon at Buffalo General Hospital. Events from the year 1901 in the United States. John George Milburn was a prominent lawyer in Buffalo, New York and New York City, a president of the New York City Bar Association, and a partner at the law firm Carter Ledyard & Milburn. Scott Donald Miller is an American author and reporter best known for his June 2011 book, The President and the Assassin. James Benjamin Parker was an American most noted for attempting to stop Leon Czolgosz from assassinating President William McKinley. Alice Russell Glenny (1858–1924) was an American painter, sculptor, and graphic artist who lived and worked in Buffalo, New York. Glenny was a fixture of the thriving artistic scene in Buffalo in the early twentieth century. From 1893-1894 and 1903–1904, she served as president of the Buffalo Society of Artists. She studied under top teachers, such as William Merritt Chase and Gustav Boulanger, in both the United States and France, and was considered in her time to be one of the city's top artists. Today, Glenny is best remembered for her Art Nouveau posters and magazine illustrations. Her posters were featured prominently in Buffalo's Pan-American Exposition of 1901, famous for being the location of the shooting of President William McKinley. She also regularly contributed illustrations to the Buffalo-Courier Express, one of the major newspapers in Buffalo at the time. 1 2 Rauchway, pp. 3–4. ↑ Kedward, Harry Roderick (1971). The Anarchists: The Men who Shocked an Era. American Heritage Press. p. 42. ISBN 978-0-356-03721-9. ↑ Rauchway, pp. ix, 14–15. 1 2 McElroy, pp. 158–159. 1 2 3 Miller, pp. 297–298. ↑ Leech, pp. 11, 582–584. 1 2 Leech, pp. 584–585. ↑ Philadelphia Record, September 4, 1901. ↑ The New York Times, September 5, 1901. 1 2 Leech, p. 584. ↑ Leech, pp. 585, 588–589. 1 2 Miller, pp. 299–300. 1 2 McElroy, p. 159. 1 2 Leech, pp. 594–595. 1 2 Rauchway, p. 11. 1 2 Leech, p. 596. 1 2 3 Miller, p. 313. ↑ Trained Nurse, p. 223. 1 2 Miller, pp. 308, 344. 1 2 3 Morgan, p. 401. 1 2 Leech, pp. 598–599. 1 2 Leech, p. 599. 1 2 3 Leech, p. 600. 1 2 Miller, p. 320. 1 2 Leech, p. 601. 1 2 3 Morgan, p. 402. ↑ Weiner, Tim (2012). "Revolution". Enemies: a history of the FBI (1 ed.). New York: Random House. p. 9. ISBN 978-0-679-64389-0. After the McKinley assassination, a Pinkerton man proposed creating a new government agency dedicated to eradicating the nation's radicals. Olcott, Charles (1916). William McKinley. 2. Boston: Houghton Mifflin. Retrieved March 23, 2012. Fine, Sidney (July 1955). "Anarchism and the assassination of McKinley". The American Historical Review . 60 (4): 777–799. doi:10.2307/1844919. JSTOR 1844919. Parker, LeRoy (December 1901). "The trial of the anarchist murderer Czolgosz". Yale Law Journal . 11 (2): 80–94. doi:10.2307/783764. JSTOR 783764. "An interview with the President's nurses". The Trained Nurse and Hospital Review. 27 (4): 222–223. October 1901. Retrieved March 13, 2012. "William McKinley: Autopsy Report". DoctorZebra.com. April 9, 2009. Archived from the original on November 23, 2010. Retrieved June 1, 2012. "The Last Days of a President" Library of Congress. Includes clips of McKinley's funeral train, McKinley at the Exposition, and the crowd outside the Temple of Music after the shooting.